Railroad tracks near Kitanagasa Dori 5-chome (北長狭通５丁目) in Kobe, Hyogo Prefecture. The area on the left is Motomachi (元町). Traditional Japanese houses can be seen along the tracks. 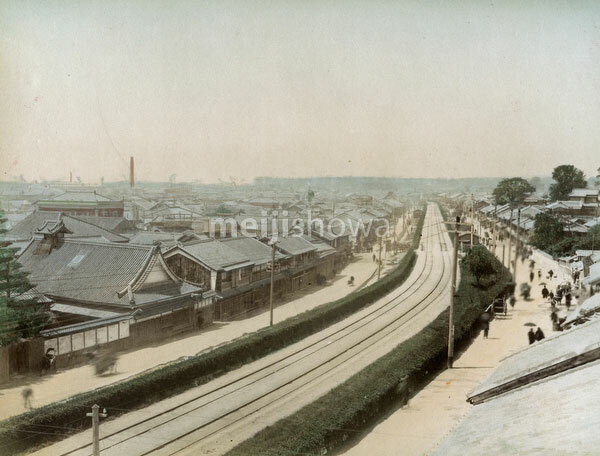 The large building on the left is Zenshoji Temple (善照寺), where Yusei Sasaki (佐々木祐誓) started Shinwa Girls’ School (親和女学校) in 1887 (Meiji 20), the forerunner of Kobe Women’s University (神戸親和女子大学).